Yesterday, The Legal Genealogist noted that researcn in Louisiana — and particularly in Louisiana law — posed some unusual challenges. And in no respect is Louisiana law and practice more different from the law and practice in common law jurisdictions that in the area of the notary and notarial records. Now we all know what a notary is, right? I mean, every one of us has had to get a signature verified at some point or another, so we went to a bank or to a drug store, or to some lawyer’s office, and some clerk with a seal came out, made sure we were who we said we were, watched us sign the document, and then countersigned it, stamped it and affixed the raised seal. And that is usually all the notary, called a notary public, does in a common law jurisdiction. And that is just scratching the surface when it comes to the notary and the notary’s duties in a place like Louisiana, or Quebec, or Puerto Rico, or any other jurisdiction where the dominant legal system comes from the civil law. You did, of course, being the avid genealogist you are, catch the key phrase there, right? The “functions as an archivist” part of that description? And given the scope of the notarial records, you can just imagine the goodies that are in those files, can’t you? And you’re right: they’re amazing. Sounds great, doesn’t it? And the best part is that so many of these records, from the Notarial Archives, have been microfilmed and can be reviewed through the Family History Library and its associated Family History Centers.8 Some few have even been digitized and can be viewed online at 3 a.m. as we sit at our computers in our bunny slippers. Alas, this is just for Orleans Parish. The City of New Orleans and its environs. And there’s a lot of information online about its research center. Complicating the search for records, both in Orleans Parish and other locations, is the fact that the records are organized by notary. So you have to know who the notary was in order to find the records of a particular family. One good way to find the notary is to find a land record in the conveyance books and see who the notary was who handled it for the family. In general, that’ll be the notary who has the rest of the family’s records. So these aren’t easy records to find, and not easy to use. Early records may well by in French or in Spanish. Bottom line, however, is that these are critical genealogical records, unlike anything found in a common law notary’s files, and worth the effort to track down. My wife’s ancestor, Jakob Tüscher, was a Rechtsagent (legal agent) in Mülchi and Reiben, Canton Bern, Switzerland, who was expelled from Switzerland in April 1819. His records are preserved in the Cantonal Archives in Bern and cataloged there as A 437 (1806-1816), and A 438 (1806-1816). Another April 1819 emigrant was Samuel Reichenbach, a Notar (notary) in Bern, an emigration commissioner. Could you venture an educated guess where his notarial records might be preserved? Would he not be required to deposit his records when he left? You’ve done more European research, and certainly more Swiss research, than I have, Ernie (my ancestors were all German peasants! ), but I’d certainly start with the alphabetical list of notaries at the FHL (film 1348020). I have ordered the microfilm you suggested and we’ll see how that turns out. But a special thank you for your followup blog today (July 27, 2016) telling us to use “notarial” as a search term. It led me to consider another possible notarial source in the emigration port, Antwerp. There were 13 notaries active there in 1819. Surely there were dealings recorded between ship captains, merchants, commissioners, and passengers there. This is material to research in Salt Lake City, as one of the had material for 70 rolls of microfilm during his tenure, others 40 rolls, 39 rolls, etc. Thanks for expanding our horizons with your blog! 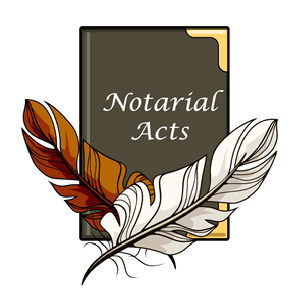 I’ve used Notarial Records for the last thirty-five years from Orleans Parish, St. Landry Parish and Natchitoches Parish and have always, found them to be invaluable and have found all of them to be invaluable records. It is a prerequisite for Louisiana research that you have a good working knowledge of French and Spanish as well as English. For the past thirty years I have been translating all available documents for Colonial Poste du Rapide, which is now Rapides Parish, unfortunately, only two Notarial books survive, from the 1820s, because they were kept at Bayou Boeuf instead of the Parish Courthouse which burned in 1864. Colonial Rapides records are of course, found in Natchitoches, Opelousas, the Archives of Louisiana and the Floridas, the Cabildo and of course, the Papales Procedentes de la Isla de Cuba, Archivio Generale de Indias, Seville, which has millions of documents. Notarial Records in Louisiana contains Wills, Conveyances, Mortgages, Depositions, Slave Sales and Marriage Contracts. Thanks Judy. I have never even thought of looking for notorial records. And…it just so happens I was researching some of my New Orleans ancestors only yesterday. Back I go. Another awesome tip from our legal guru. Great! Hope you find lots of goodies.